To the British observer, the American celebration of Thanksgiving can seem quite a strange and alien affair. In fact Thanksgiving stems from the tradition in many European countries of celebrating the Harvest. 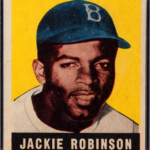 However the American tradition isthe most well known and widely celebrated. 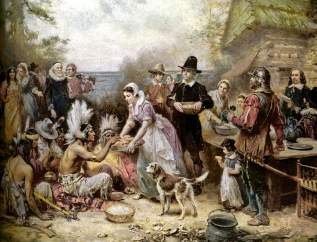 Though alike with its European contemporaries in giving thanks for plentiful food, the American experience is further appropriated with the first harvest celebration by the colonists upon arriving on the continent. 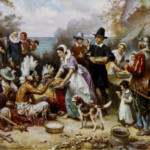 Yet the story of the first thanksgiving was unknown in America until the mid-19th century. The first ‘thanksgiving’ upon American shores was in fact better known in Britain, as the puritan chronicler, Edward Winslow, had published his account in London – in 1622. 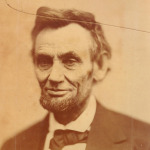 Its rediscovery by the American people was prompted by Sara Josepha Hale, a novelist and magazine editor, who 1846 started a national campaign for the recognition of the holiday. 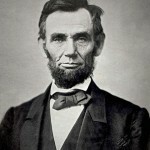 In 1863, in the midst of the American Civil War, Abraham Lincoln declared that the last Thursday of every November be the national day for Thanksgiving. By the 1870’s the story was taught in schools across the country. Thanksgiving, perhaps more so than the giving thanks and the celebration of the harvest, now acts as commemoration of this account. What is this story that the Americans celebrate every year? The accounts usually centre on the pilgrims on board the ship called the Mayflower. The ship had left Plymouth,on the southern coast ofEngland, in September 1622 and made a 66 day crossing that eventuated in anchoring off the coast of the Massachusetts Bay. Throughout the winter of their first year, most pilgrims stayed on the Mayflower and suffered from scurvy and a number of diseases. Only half of the pilgrims survived this first winter. By March the survivors came ashore, but were greeted with an astonishing surprise from a Native American called Squanto. A member of the Pawtuxet tribe, Squanto earlier in his life had been captured by the English and sold into slavery, before escaping to London and returning home. Squanto could now in fact speak English and interpreted for his tribe and the pilgrims. During their first spring Squanto taught the pilgrims how to grow corn, extract sap from trees, catch fish and avoid poisonous plants. By November of 1621 the new colonists reaped the rewards of their harvest, and invited the Native American tribes they had befriended since their arrival. Thanksgiving therefore is not just a reimagined Harvest festival as in European tradition, but instead a commemoration of an instance of peace between the Native Americans and Colonists. An event which is often forgotten in the turbulent history of the relationship between Native Americans and the colonists.